Why do we put a project aside and let them become the dreaded UFO--UnFinished Object? I've been thinking about it because I have a few of these. I really want to finish my Safari jacket and am afraid if I don't get to it soon, it will fall into the permanent UFO pile. I've been working on a few unplanned projects this month and have finished the most urgent. So when I finished putting the binding on a project that I will reveal this weekend, I grabbed my box with the jacket, pattern instructions and supplies. figuring out where I left off. It isn't as if we put them away think that we are putting it away for an extended period. So, the first thing I did was to read and reread the instructions and look at what has and hasn't been done. Then, I ironed the wrinkly mess and put it on Dorothy the dress form. I am much closer to finishing than I remember. It's isn't that close, but I am closer than I remember. It looks like, I have to remove some basting, do some catch stitching, top stitching, and finishing some edges and putting in the hem. 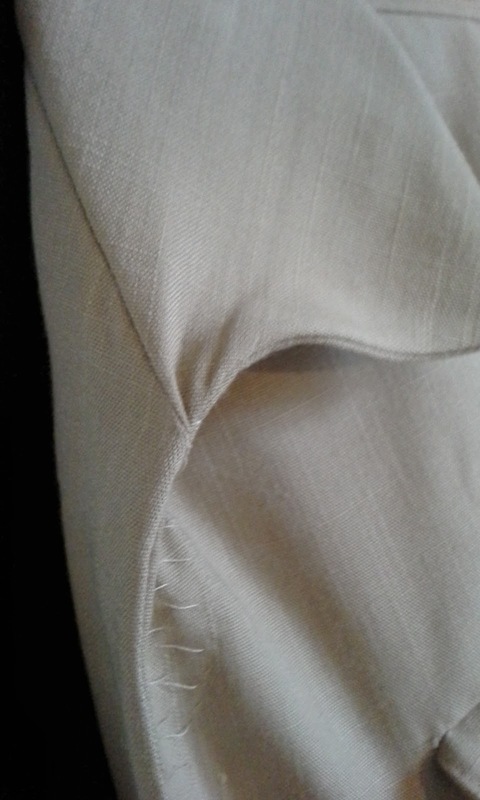 Then, put in the sleeves, make the belt, makes some buttonholes and I think I'm done. It sounds like a lot, but, if you remember this jacket is a pretty big undertaking. I don't think I've found any that have been completed using the instructions. Most have changed to other methods at some point. I switched to machine buttonholes and I hope I can finish with that as the only variant. I do have a strange wrinkle at the front where the collar meets the front edge where it will roll. I almost think I can live with it if it means that I finish this. I'm hoping that I can finish this jacket so that I can wear it on Saturday. Isn't frustrating when you have no idea how things went wrong? This happened to me this afternoon lining up a skirt and bodice -- ahh they didn't match! I have no idea where Dorothy's name came from. I do wish I could get her measurements to match mine, but her neck doesn't shrink anymore. I put this jacket down to make something else and then it kept being set aside. I have an event that this would work well with on Saturday morning. I hope I finish. It would be fun to get blog pictures in action!